Anandtech has determined the iPad GPU to be the PowerVR SGX543MP2, a more advanced dual-core version of the PowerVR GPU found in the original iPad and iPhone 4. Architecturally the 543MP2 has more than twice the compute horsepower of the SGX 535 used in Apple's A4. Each shader pipeline can execute twice the number of instructions per clock as the SGX 535, and then there are four times as many pipes in an SGX 543MP2 as there are in a 535. They found that the new graphics processor offered over 3-5x the speed in simple geometry tests over the original iPad. Anadtech then used the GLBenchmark 2.0 to provide a broader range of testing and included the recently released Motorola Xoom tablet. They found that in this overall benchmark, the new iPad 2 ran at 5.4x the framerate of the original iPad and 3.7x the speed of the Xoom. 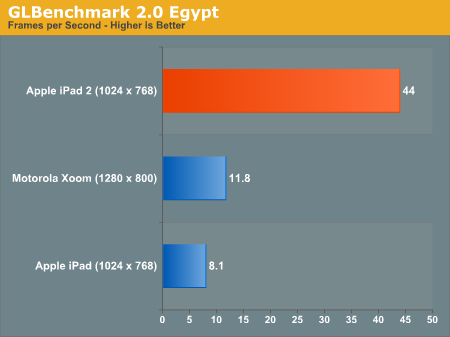 Other benchmarks showed improvements ranging from 3x-7x the speed of the original iPad. Ultimately, this will mean that developers will be able to offer significantly higher graphics quality and performance on the new iPad 2 over previous generation devices. We've already seen some early results in Infinity Blade, but the changes should become more dramatic as developers have time to sit down with the new devices. Of course, the iPad 2 represents a small percentage of iOS devices, but Apple is widely expected to integrate the same CPU/GPU into their upcoming iPhone 5 and future iPod Touch product lines. I want to know why someone would mark this as a 'negative'? Must be a Fandroid as an earlier poster mentioned.